Loganair's flights between Westray and Papa Westray, two islands in the Orkneys off the British coast, are the world's shortest at only 1.7 miles. They're planning to go electric, either by replacing the current plane's engines or getting a new one. It takes about two minutes - including taxiing - to complete the 1.7 mile Westray / Papa Westray leg flight, which is about the same length as the runway at Edinburgh Airport. The record is 53 seconds. The short inter-island services are seen as an ideal possible route for electric planes as a limitation of the aircraft would be range. As well as Westray and Papa Westray, the inter island routes via Kirkwall on mainland Orkney also serve Sanday, Stronsay, Eday and North Ronaldsay. The flight spends as much time on the runway taking off and landing as it does in the air between the islands. 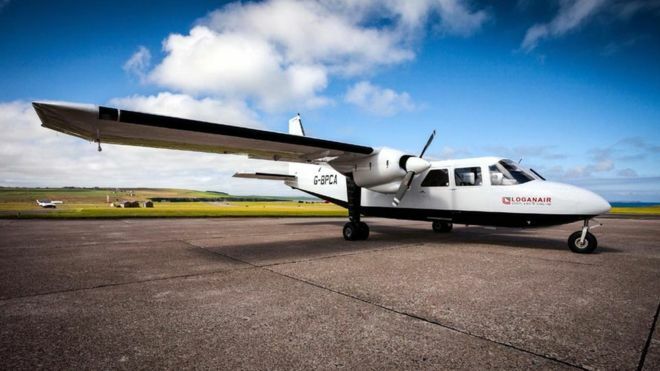 Three airlines bid the last time the subsidized service came up for tender, according to the Orkney Islands Council News.